Flexicalls Voiceline is a prepaid service that offers a wide range of calling plans to meet the diverse communication needs of its' customers. Provides a specific numbers of monthly minutes for calls to particular region such as U.S./Canada, Europe, Asia, India or Israel. Learn more.. Regardless of whichever plan you choose, you can make calls anywhere worldwide, by putting funds on your Flexicalls Voiceline reserve funds account. You Save with great low rates no matter which plan you choose. Your telephone and high speed Internet connection is all you need. Remember, you can take your Voiceline adapter anywhere there is a high Speed Internet connection and enjoy the convenience of never missing another important call. Friends and Relatives Save. Lets say you do not reside in the U.S., but your relatives and contacts do, and they have to pay long distant to call you! No Problem. With Flexicalls Voiceline you can have a U.S. number and your friends and relatives can call you anytime; its like living right next-door. You Both Save when calling from Flexicalls Voiceline to Voiceline. 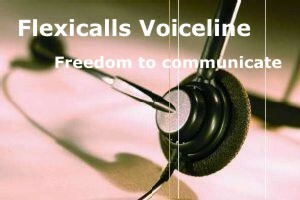 All Flexicalls Voiceline subscribers on a monthly plan enjoy FREE calls when calling each other. Voicemail, Call waiting, caller ID, 3-way calling, call return (*69), call forwarding, call blocking and call transfer. In addition, With our 24 hour account center, you can manage your service features, retrieve voice messages, have voice messages emailed to an email address, or view your call records and billing history.